We held a game day gathering for the TTUN game, as many clubs did across the country. 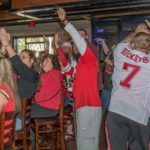 What’s special about ours, besides creating a community for local Buckeye fans here in Jacksonville, is the amount of money we raised for our scholarship fund compared to other game days; our club average is anywhere between $350-600…. Join our new Bowling League! Thank you JAX Buckeyes for supporting scholarships! Michael Bennett, who helped the Buckeyes last year win a National Championship and a rookie with the Jacksonville Jaguars this season, visited our club during the Ohio State vs. Hawaii game watch! We thank him for taking some time to take photos with us and sign autographs!